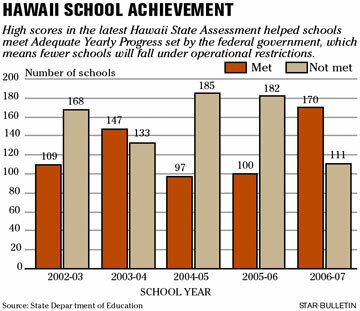 For the first time in six years of testing, Hawaii public school students showed major gains in annual state math and reading exams, nearly doubling the number of schools meeting progress benchmarks set by the federal government. 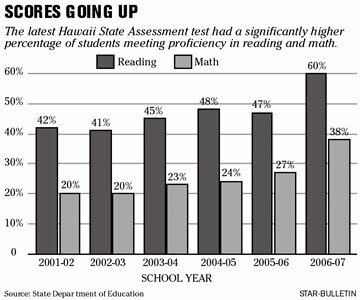 Sixty percent of students tested in this spring's Hawaii State Assessment scored "proficient" in reading, up from 47 percent last year. In the math section, 38 percent of students were proficient, compared with 27 percent in the previous year. State Department of Education officials, however, acknowledged that the comparison with previous test results is not entirely accurate as students were judged for the first time this year on a new test based on new standards. That raised concerns yesterday among several Board of Education members, who questioned whether the exam painted a true picture of student progress. Schools have been pushing hard in recent years to raise test scores in math and reading to avoid sanctions under the No Child Left Behind Act. Test results suggesting public school students have improved significantly in reading and math for the first time in six years are misleading because they were based on a new exam, several Board of Education members contended yesterday. State education officials released the results of the latest Hawaii State Assessment yesterday, saying there was reason to celebrate all across the state. But the higher scores came in the first year that a new testing company was in charge of developing and administering the tests. "I'd like to say, 'Great, we are doing better.' I'd love to say that. But if we are not, then we shouldn't say it. And obviously, we can't prove it," said Donna Ikeda, one of four board members who questioned the test. "There's going to be doubt in the public's mind in terms of how valid these results are." Under a $7.3 million-per-year contract with the state Department of Education, American Institutes for Research was chosen last year to replace testing firm Harcourt Assessment Inc. In 2004, officials found more than 40 errors in the Harcourt tests, and a year later, exams were delivered late or to the wrong schools. Robert McClelland, director of the Education Department's Systems Accountability Office, said the old tests quizzed students on topics they had never studied and took them as long as 10 hours to complete. The new exam, he said, is about an hour shorter and lists only problems students should know. "I think there's a direct connection and a link now to what's going on in the classroom," said Schools Superintendent Pat Hamamoto. Schools have been pushing hard in recent years to raise test scores to avoid sanctions under the 2001 No Child Left Behind law. The law requires schools to meet steadily rising proficiency percentages, culminating with all students being able to read and solve math problems at their grade level by 2014. In general, 28 percent of a school's students had to meet standards in math and 44 percent in reading standards this year. In 2008 those requirements rise to 46 percent for math and 58 percent for reading. Failure to reach so-called adequate yearly progress triggers steadily tightening sanctions. The stiffest is a broad school reform known as "restructuring," which entails intervention by outside educational firms at state expense. The number of schools that met adequate yearly progress went from 100 last year to 170 this year. In all, 11 schools saw sanctions removed; four of them had been under restructuring. Two schools entered restructuring this year, bringing the number of schools under the status to 48, or two fewer than last year. Of the 283 schools, 162 still face some form of sanction. Aiea Elementary, which has many economically disadvantaged students and immigrants with English as their second language, fell into restructuring three years ago and contracted with one of the firms, Edison Alliance. It finally shed sanction status this year. "The format was a little bit different, but we felt it measured the standards equally as well," Elizabeth Hueu, curriculum coordinator for the school, said about the test. This year's test, taken by more than 92,300 students from third through eighth grade as well as 10th grade, was a major turnaround from past years. It showed that 60 percent of students scored "proficient" in reading, up from 47 percent last year. In the math section, 38 percent of students were proficient, compared with 27 percent in the previous year. Most of the reading gains came from middle- and high-schoolers, and students in lower grades did better in math. Scores went up for every grade except in fourth-grade reading, where 54 percent of students met proficiency, down from 58 percent last year. The best showing came in 10th-grade reading, with 65 percent of students achieving proficiency, an increase from 43 percent a year ago. A second portion of the test found isle students performed close to the national average. But board members noted that the number of students who have placed "well below" proficiency has grown for almost every grade and subject area. "My concern is, What are we going to do about this?" asked member Herbert Watanabe. Education officials said they would review the scores and come back before the board next month to present a detailed, school-by-school breakdown of the test, answer concerns about its validity and explain strategies for further improving scores.